This weekend the Christian Church (Eastern and Western) celebrates Easter, or more precisely, Resurrection Sunday, which commemorates the rising of the Lord Jesus from the dead, never to die again but always reign eternally and be the intercessor for His people. There is so much to ponder here. Placing your trust in this One is quite literally a destiny changer, from an eternal separation from God to being joyfully in His presence for all of eternity. 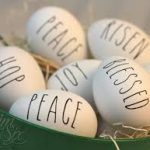 I want to give you a few “Easter Eggs”, hidden among some sites on the Internet which I hope will prove to be helpful and a blessing to you. Virgin Womb & Virgin Tomb – This is a reflection which I did on the interesting parallel between the physical birth and rising-from-the-dead birth which the Lord Jesus experienced. A Picture of Human Destiny – The Gospels tell us that the Lord Jesus was crucified between two criminals. What happened on those three crosses during those six hours one Friday is a picture of the destiny of humans into eternity. The Ten Minute Bible Hour – In line with our ongoing Year of Biblical Literacy, I’ve found a set of videos on You Tube from Matt Whitman, who does a fantastic job briefly discussing elements of Biblical literacy and does so accurately, engagingly and with a nice dose of humor added in. I highly recommend you watch these. Subscriber to his You Tube channel. I’ve provided a link to the introductory episode. Charles Spurgeon on Jesus’ Coronation – Charles Spurgeon, the 19th century British minister known as the Prince of Preachers wrote a devotional called Morning and Evening. It has two reflections on Scripture for each day, one in the morning, one in the evening (you probably guessed that from the title). His morning reading for April 7th talks about Jesus’ path to Golgotha (the Place of the Skull, as it is called), the site of His crucifixion. Great insights by Spurgeon. American Gospel – Finished watching the entire documentary yesterday. Phenomenal video contrasting the true Gospel of Christ with American-created distortions of it. The link is to the You Tube version which contains the first 40 minutes of the video. Please watch this. Every unbeliever in Christ needs to hear and see this. Every believer in Christ needs to see and hear this to be reminded of what Christ has done for us and who we are in Christ. 1 Corinthians 15 – This chapter of the Bible is a great summary of the Gospel. I’ve been challenged by a local pastor to reflect on the depth of this chapter during this month which contains Good Friday and Easter Sunday. Pay particular attention to verse 17. It says, in essence, that if Christ died and stayed dead, believers are still in their sins. Jesus needed to rise as well as die. Happy Easter, Resurrection Sunday and Pasach!!! Episode 106 centers on a discussion about God being in all places at the same time (omni-presence). As a result, we never truly leave His presence. 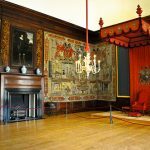 Several writers of the past have likened this to an encounter that a citizen of a kingdom would have with his king or queen in a special room designed for such meetings. A Presence Chamber would be the place of such an encounter. This analogy is useful in helping us to understand the importance of knowing that with God in Christ, we never leave the divine Presence Chamber. This episode also feature a reading from F.B. Meyer’s book “The Secret of Guidance.” The reading is from Chapter 8 is entitled “In The Secret of His Presence.” A link to this book on the Christian Classics Ethereal Library website can be found here. Audio Post 8 centers on a commentary on 1 Thessalonians 5:16. 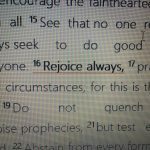 How is it in a world of real pain, trouble and evil, we are called to “Rejoice Always?”. Link to the original 2010 article from School of the Solitary Place. Happy Easter 2017 to all the readers of Restoring The Core and listeners to the Finding Hidden Treasure podcast. This minisode is a reflection of biblical passages which address the fact that the Lord Jesus was born from a virgin womb and a connection to why Christ was raised back to life from a tomb which had no previous occupants. There is an old saying that life is a womb to tomb experience. This saying, when applied to the life of the Lord Jesus while here on Earth, is rather significant. The Gospel writers are explicit in pointing out that Jesus’ conception was a virgin conception. The first chapter of the Gospel of Matthew, verses 18 to 25 make this fact clear. In the 7th verse of the Gospel of Luke chapter 2, Luke states that Jesus was Mary’s firstborn son. A logical conclusion of the virginal conception of Jesus is that no one else resided in Mary’s womb prior to the Lord Jesus miraculously being brought into human existence in that womb. Let’s consider what happened to Christ years later. On the afternoon of the death of Christ, Joseph of Arimathea attended to Jesus’ corpse. In Luke 23:53, we read: “Then he [Joseph of Arimathea] took it down and wrapped it in a linen shroud and laid him in a tomb cut in stone, where no one had ever yet been laid.” Luke presents a detail that may seem insignificant in the account when he indicates that the tomb had not had a previous occupant. Is this simply an incidental point, or is there something more going on? I think there is quite a bit more going on here which we can piece together with the help of several other passages from the Bible. In the New Testament, Jesus is contrasted with Adam. In Romans Chapter 5, we find the Apostle Paul contrasting Adam with Christ. A wrong relationship with God and death were brought in by means of Adam. Right standing and life before God were brought in by means of Christ. In 1 Corinthians 15 verses 22 and 45, the contrast continues. Death in Adam; Life in Christ. Adam is the first Adam (by definition). Christ is the last Adam. Adam and Christ represent two different humanities. Jesus was not merely the firstborn of Mary. Jesus, the first occupant of Mary’s virgin womb is the firstborn of a new humanity. 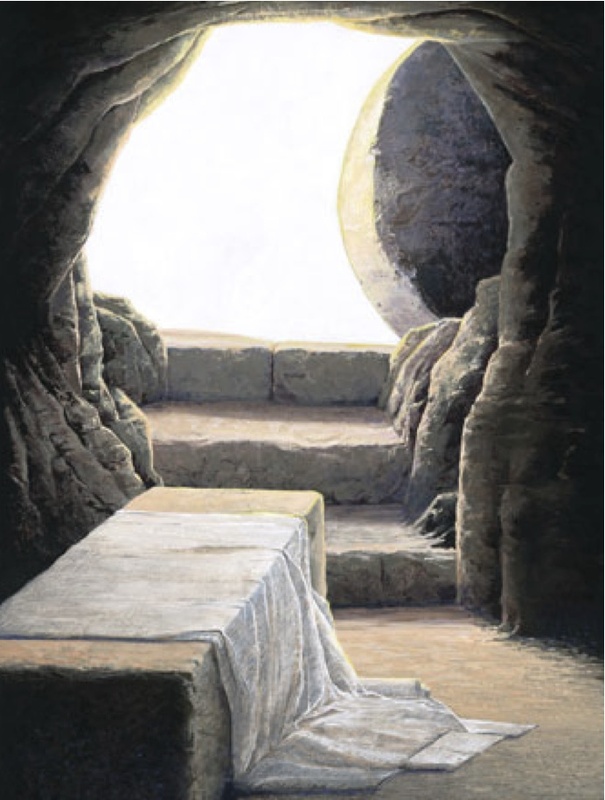 So, how does Jesus’ tomb, a tomb which had no prior occupant, fit into this? On the day of Christ’s resurrection, the tomb in which Christ’s body lay, acted as a sort of womb. On that day, the earth gave birth to someone who was dead and then birthed miraculously into a new, immortal humanity as its pioneer member. In summary, both Jesus’ physical birth from the womb of Mary and His resurrected re-birth from a tomb of the Earth make Him a firstborn. The firstborn of Mary. The firstborn, the preeminent one, of all creation. The firstborn from the dead. By trusting in Christ for our life, the promise of Isaiah 26:19 becomes our promise. We too in our physical death will be “birthed” from our tombs in the Earth into the same kind of immortal life which Christ has now. By faith in Christ, we actually make a species change, from Adam humanity to Christ humanity. By trusting in Christ, His past becomes our past. His future becomes our future. Our present is linked to His. Glory to God for such a blessing in Christ.